The Marathon Mondial is Schwalbe’s flagship expedition touring tyre – the last word in durability, with predictable off-road handling without completely sacrificing speed on tarmac. 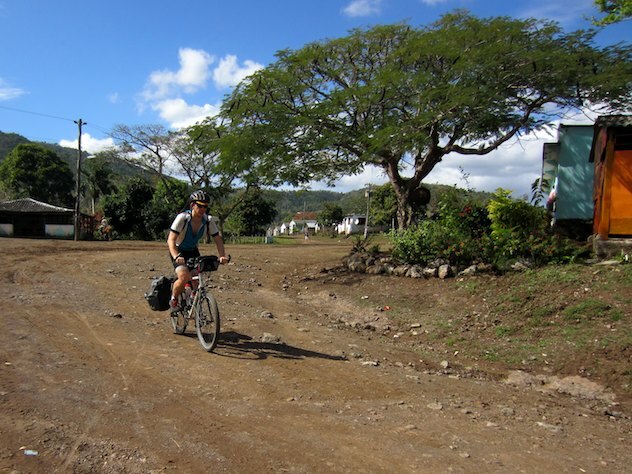 If you aren’t going to be riding on unpaved roads, the Marathon Mondial is probably not for you. While Schwalbe have done a great job mitigating the effects of the tread and tough build of the Mondial on rolling resistance, it’s very noticeably slower than a slick road tyre – no surprises there! At the time of writing, Chain Reaction are doing a healthy 28% discount on the 700C and 26″ sizes. Wiggle might be worth a look too for both 700C and 26″ (currently 10% off). The Marathon Mondial rolls much better than you might expect from a photograph – the chunky tread is carefully designed so that an almost smooth centre ridge is presented to the tarmac under normal riding conditions. On a mixture of sealed and unsealed surfaces, the Mondial might just be the perfect compromise. However, if you expect tarmac rolling performance along the lines of the Marathon Supreme you will be disappointed – there are no miracles! The width of the Mondial makes it very agreeable from the rider’s point of view. Potholes, debris and rocks and boulders on dirt trails are eaten up without drama. Altering the tyre pressure sensitively to conditions is very important. 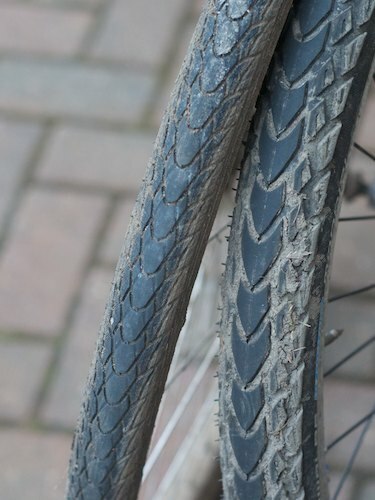 At 85psi the tyre is as rigid as possible to minimise rolling losses, and jarring if you ride down steps or similar. Off-road I go for 50psi to improve comfort and handling – still plenty of air in a 2″ tyre to protect the rims from sharp impacts. The Marathon Mondial is designed for off-road use and has a wide hybrid tread. The centre studs are very large and closely interlock to keep the tyre stable on tarmac and minimise rolling losses. Beside this, two rows of side studs are provided to dig in when the going gets rough. 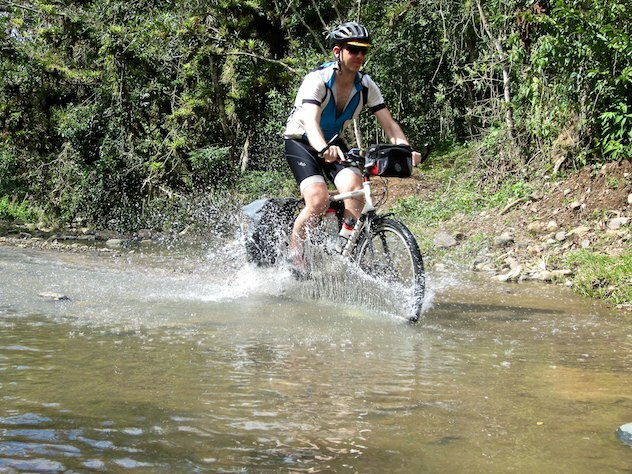 The Mondial is extremely stable in descent on mud and dirt – I proved this to myself with a shakedown on local mud before hitting Cuba, and the Mondial continued to prove its worth on a big day’s crossing of the Sierra Maestra. The rubber formula, Schwalbe’s Endurance compound, is shared with the old Marathon XR, and designed for ultimate durability. Intuitively, the tyre must be less grippy if the rubber is longer lasting (not as sticky), but I found them very reassuring in all sorts of conditions, from high speed wet descents on tarmac to river crossings and sloppy muddy climbs, all fully loaded. The Schwalbe Marathon Mondial loads it up on puncture resistance with Double Defence (SnakeSkin sidewall protection and a high-tech fibre breaker strip) combined with the extra hard Endurance compound. Mine are looking very good so far, but I’ll update this if and when I encounter problems (I commute a substantial distance on a disused railway path covered in glass, putting any tyre through its paces). Others who have put much more time onto the Mondials than I will be able to speak of their ultimate lifespan, but after plenty of hard use with a 30kg / 65lb load mine still look pretty new. This is where Schwalbe really focused their efforts, delivering a tyre that can be expected to give many thousands of miles on the road, and it shows. The tread and sidewall construction are absolutely first rate. At 650g for the 700x42c folding version, the Marathon Mondial is not the lightest tyre ever made – the same size Marathon Supreme comes in at 495g. But then, how heavy is “heavy” for an expedition tyre anyway? You probably don’t want to risk an expedition with no spare tyre, but confidence in the Mondial might allow you to conscience a trip with only one spare, and that could end up being a pretty big weight saving. 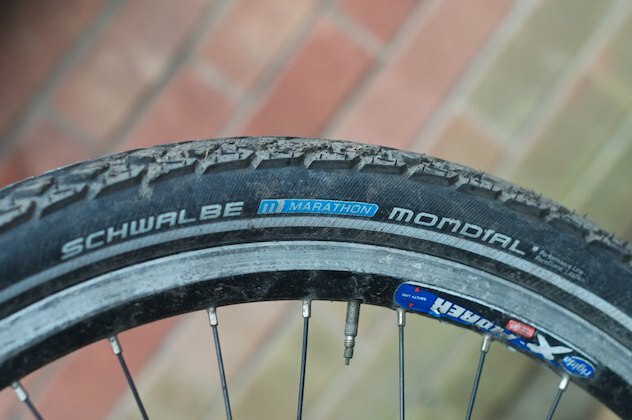 I bought into the Marathon Mondial because I wanted a tyre that would perform predictably and reliably on muddy trails, yet not be ridiculously slow on tarmac. With a 30kg load-out I wanted something fat enough to protect the bike, and to give me the confidence to risk one (relatively fragile) spare. The Mondial is a tremendous expedition tyre and absolutely didn’t disappoint. I was able to plough through deep muddy tracks and ford rivers with aplomb, while I didn’t feel it was too hard to keep up on tarmac sections either. I haven’t done enough mileage on mine yet to be definitive about durability, but I think it’s encouraging that they still have their mould line after 1000+ miles. Just be warned – because they are big and designed to go everywhere they just aren’t going to be as fast as a road touring tyre! The Mondial dwarfs the 40mm Marathon Plus (and there’s not much weight between them! I’ve used a pair of Marathon Mondials for a couple of trips so far, most recently in West Africa. I spent 3 months in West Africa on a mixture of paved roads and insanely rocky dirt roads. Not one puncture and the tires hardly have any wear on them at all. Completely recommend them, but they do seem a little bit overkill! Thanks for the feedback Matt – commuting on mine for a month or two has certainly made me stronger on the bike. Got on the racer last week and was absolutely flying in comparison! Thanks for the review Dave. I currently have Schwalbe Marathon Mondial HS 428 47-622 tyres on my Surly Long Haul Trucker and my Extrawheel trailer. I fitted them for and road with them on my Chasing the Dirt tour, so have done 3,720 kilometres on them. They are looking good with only one puncture on the trailer of all places. I found them good touring on both bitumen and dirt (over 1,000 km of dirt in fact). All up good touring tyres in my view. Thanks for the links. I can’t believe that you actually ride that LHT and yet get it so clean for these photos! Not the Mondial, but it seems that Schwalbe have made changes to their heavy weight tyre, the Marathon Plus for 2014. They are claiming improved “rolling resistance.” Care to test these? I have big 700C Marathon Pluses on my commuter at the moment. Guess there’s no point writing a review of those any time soon! Mr McCraw! This blog has continued to be useful in our household–while I was reading your reviews of tyres and lights and things, my wife was stealthily scouting for ideas for my Christmas present, which turned out to be the Freedom Carry trailer you recommended. Thanks for all the write-ups. I’m hesitating between Schwalbe Big Bens and Marathon Supremes. I’ve found current prices almost equal, which seems to make the latter an exceptional bargain at about £32/pair. Most of my riding is around the city, with occasional rides along the John Muir path and its stretches of mud or gravel. I haven’t ridden the Big Bens, but I can whole-heartedly recommend the Marathon Supreme for tarmac or things like the more civilised parts of the canal towpath etc. – very comfortable and very supple, and would be my choice for long tours if they would only have a small proportion of unsealed surface. It would not be that great on mud however for fairly obvious reasons. The tread is entirely cosmetic. I think that if that is going to be an important use case for you the Big Bens might be a better choice. Dave, thank you so much for the time you put in this awesome review of Schwalbe Mondials. 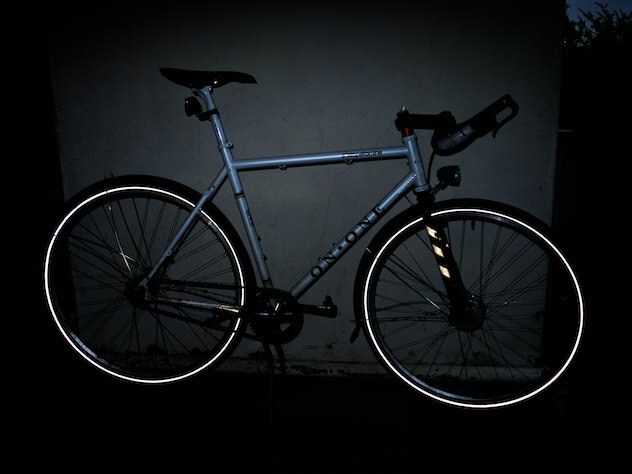 I have a Cannondale Hybrid bike with 700 x 38 tires. We ride on a lot of varied terrain including asphalt, rail-trails, boardwalk, etc.. Sometimes our trips span many days. A Schwalbe rep said I should consider the Mondials however they do not make my size. He said the 700 x 40 would be just fine. What are your thoughts here? In practice there is a lot more than 2mm variance between different brands (or models) even when the size is supposed to be the same. I would imagine you’d be just fine going from 38 to 40mm in this case – they could be a bit bigger, or even a bit smaller than your current tyres! They’re great, I don’t think you will regret it. Would you go with the folding or wire bead for a hybrid bike? Thanks you Dave. Would you opt for the folding or wire bead for a hybrid bike?? There’s no difference except for the weight (and cost!) so you just have to take your pick I’m afraid. As a rule I always go folding unless I want extra exercise (commuter, mountain bike). We have just changed to Schwalbe Mondial tyres in preparation to riding the Great Divide in the summer. With a load of 25kgs we had an unnerving blow out after about 250 kms. Were we just unlucky getting a faulty tyre or have other people had problems like this? 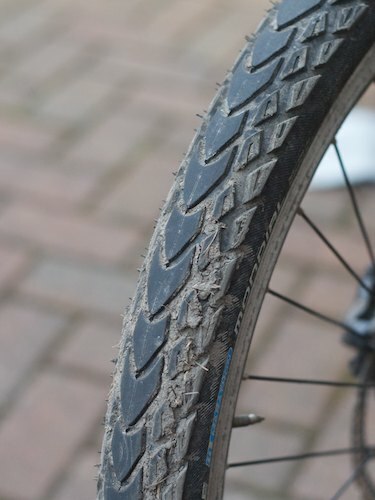 We have ridden thousands of miles with the old style Schwalbe tyres off road with no problems. My touring mate and I just put mondials on pour touring bikes a few months ago. We have less than 1000 miles on them so far and both of our tires seem to have some dry rot cracks forming around the edges of the tread knobs. Is this normal? Mine are not like that, but I do have a pair of Schwalbe Ultremos showing some weathering of the rubber. It seems to be cosmetic. FWIW, I recently bought some new Maxis tyres for my 29er hardtail. I have noticed cracking around the base of the edge knobs after a short mileage (250-300) but it doesn’t seem to be making any difference in use, or progressing. Any chance you pinched the tube mounting the tyre? I’ve previously had a blow out where I think the tube was just trapped slightly and all was well until it rubbed through at the bead, then bang! I’d be interested to know if it happens again (you could mount the tyre on the rear to be on the safe side) – or was the tyre itself damaged? I have ridden on lots of different schwalbe tires. All the bikes in our stable have them. These mondials come with a race gaurd option in the wire bead. If you after puncture protection I would not rate this “race guard” option very highly. I ran a set of big apples for 3 years with only one puncture these were the old kevlar guard, on switching to new big apples with “race guard” I have had a dozen punctures in less than a year. I even upgraded to downhill inner tubes, but still they keep coming. So make sure you go for the “double defence” option, and not the “race guard”, they are worlds apart in terms of puncture resistance. Hi. Could anyone explain the difference between Mondial and Dureme tires? I’m looking at 29/2″ versions and only Duremes are available in local stores.. planning to use them for (loaded) touring, ~ 50% tarmac and 50% trails/gravel, would Duremes fare significantly worse than Mondials in my case? I have had the 700x42c Schwalbe Marathon Mondials (folding) on my 2012 Specialized Crosstrail Sport Disk (heavily modified for trekking) for almost three years now, riding every day in Thailand and Cambodia (also traveling on airplanes, trains, buses, tuk-tuks, etc.) on super highways, broken pavement, gravel, mud, country roads and city traffic – with not a single flat. I have had the front wheel bent in an accident with a motorcycle and the rear wheel rim crack in multiple places and spit out a spoke (already replaced with a new wheel), but the Mondials are still in great shape. When I finally replace them it will be with Marathon Mondials again.